Occasionally, Booker writes today, one comes across a story so mind-blowingly unexpected and out-of-left-field that it seems hard for readers to take on board that it is true. Such is the story he first reported in his column last month, under the heading, "Our lights will stay on, but it'll cost us a fortune". 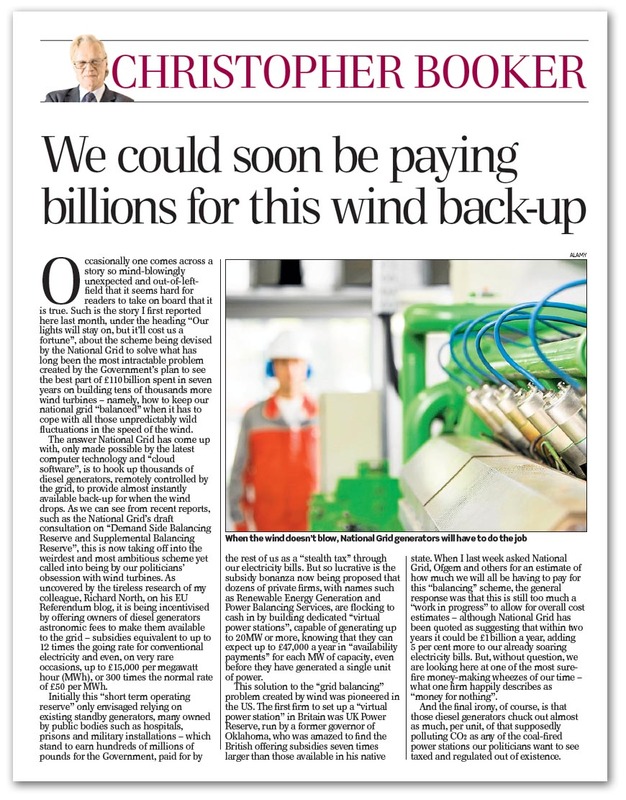 This was about the scheme being devised by the National Grid to solve what has long been the most intractable problem created by the Government's plan to see the best part of £110 billion spent in seven years on building tens of thousands more wind turbines – namely, how to keep our national grid "balanced" when it has to cope with all those unpredictably wild fluctuations in the speed of the wind. The answer National Grid has come up with, only made possible by the latest computer technology and "cloud software", is to hook up thousands of diesel generators, remotely controlled by the grid, to provide almost instantly available back-up for when the wind drops. As we can see from recent reports, such as the National Grid's draft consultation on "Demand Side Balancing Reserve and Supplemental Balancing Reserve", this is now taking off into the weirdest and most ambitious scheme yet called into being by our politicians' obsession with wind turbines. This is the story we uncovered in early July, discovering that owners of diesel generators are being incentivised with offers of astronomic fees to make them available to the grid – subsidies equivalent to up to 12 times the going rate for conventional electricity, and even, on very rare occasions, up to £15,000 per megawatt hour (MWh), or 300 times the normal rate of £50 per MWh. Initially, this "short-term operating reserve" only envisaged relying on existing standby generators, many owned by public bodies such as hospitals, prisons and military installations – which stand to earn hundreds of millions of pounds from the Government, paid for by the rest of us as a "stealth tax" through our electricity bills. But so lucrative is the subsidy bonanza now being proposed that dozens of private firms, with names such as Renewable Energy Generation and Power Balancing Services, are flocking to cash in by building dedicated “virtual power stations”, capable of generating up to 20MW or more, knowing that they can expect up to £47,000 a year in "availability payments" for each MW of capacity, even before they have generated a single unit of power. As we reported, this solution to the "grid balancing" problem created by wind was pioneered in the US. The first firm to set up a "virtual power station" in Britain was UK Power Reserve, run by a former governor of Oklahoma, who was amazed to find the British offering subsidies seven times larger than those available in his native state. Last week, Booker contacted the National Grid, Ofgem and others for an estimate of how much we will all be having to pay for this "balancing" scheme. The general response was that this is still too much a "work in progress" to allow for overall cost estimates. Effectively, the National Grid is asking us to sign a blank cheque. As near as we can get to a cost is National Grid quoted as suggesting that within two years it could be £1 billion a year, adding five percent more to our already soaring electricity bills. But, without question, we are looking at one of the most sure-fire moneymaking wheezes of our time – what one firm happily describes as "money for nothing". But the final irony, of course, is that those diesel generators chuck out almost as much, per unit, of that supposedly polluting CO2 as any of the coal-fired power stations our politicians want to see taxed and regulated out of existence. This has to be a higher form of insanity, when "clean" wind is made possible only by using "dirty" diesel.